Plaid & stripes are consistently popular in fall fashion. One thing I have received a number of emails about is how to “pattern mix” these two fall trends. So, today I decided to show you three outfits that mix plaid and stripes. This first outfit (above) has my absolute favourite new scarf. technically it’s “windowpane” but you get the point) other than via a striped shirt. 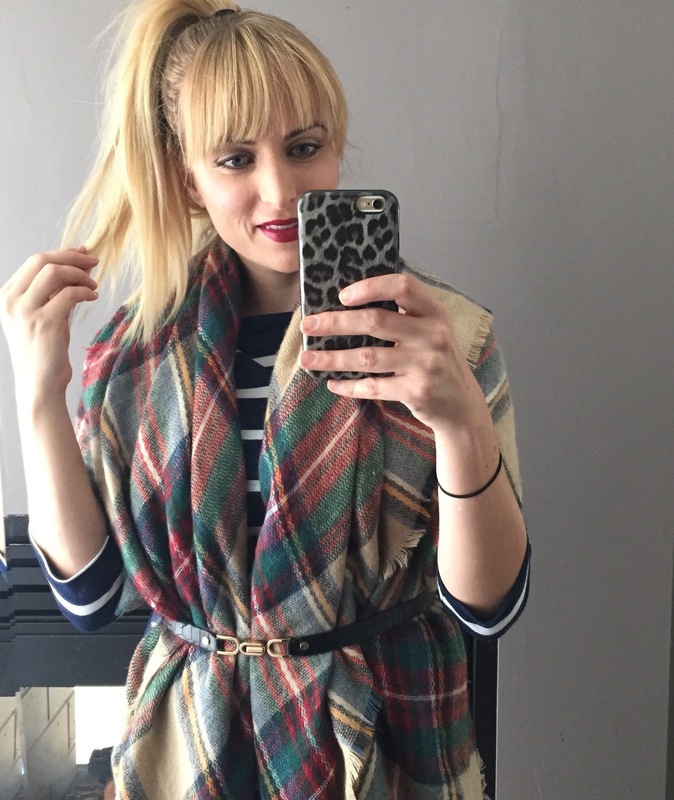 Finally, this last outfit shows one of my favourite ways to wear blanket scarves- belted over a dress! Stripes and plaid are a great look for fall. Click through the widget below to see the striped and plaid items I am currently craving! Have a great Monday everyone! See you back here on Wednesday. Great outfits and they all look so comfy! No problem Izzy! I am so glad they inspired you! Hope you are having a great week. Thanks so much Shauna! It is So. friggin. comfy! I love how stripes and plaid look together! Me too! Such an effortless way to look chic and polished in the fall! I love the mixed prints/ The plaid and stripes is so perfect for this transition time. Thank you! I love doing print mixing – done well, I think its such an easy way to make an outfit look stylish! Love the pattern mixing you have going on! Especially those grid pants and how you styled the blanket scarf! I haven't thought of wearing it that way, but forsee it in my near future:)! Aw thanks Emily! I am so glad you like the look! Definitely try wearing it that way! Love all of them, I love the mix of plaid with stripes!! Plaid and stripes are my favorite! You styled them to perfection here. Looking beautiful as ever!! Stripes and plaid are two of my favorite patterns to mix….this all looks adorable! Right?! They just go so easily together! Love all your looks, especially the first outfit! 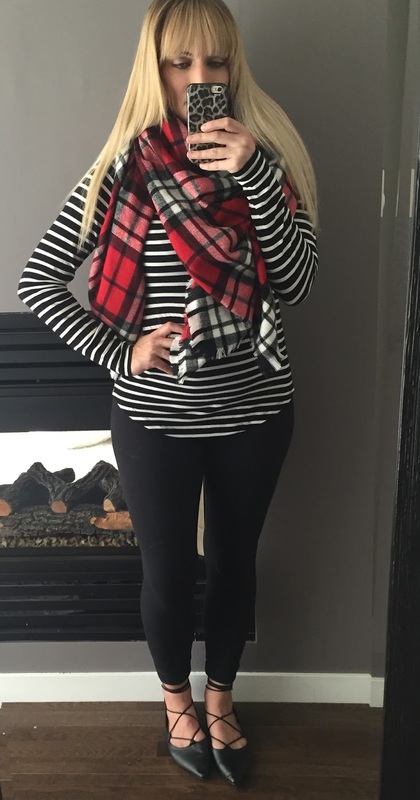 The plaid scarf is so versatile and I love your laced flats! Thank you so much Mary!! I have been wearing the lace flats soooo much recently! haha they are so comfy! ok love love love your print mixing here!! Ahh yay!! Thanks so much Sandy! You are so stylish, so that means a lot! All of these outfits look amazing on you! I love plaid and stripes together!!! I think the first outfit is my favorite, though. Thank you so much Tif! The first outfit is soooo comfy! haha I want to live in it! Ohh, I love all of these looks, but the blanket scarf belted around the dress is my ABSOLUTE fave! Thanks so much Carrie!! 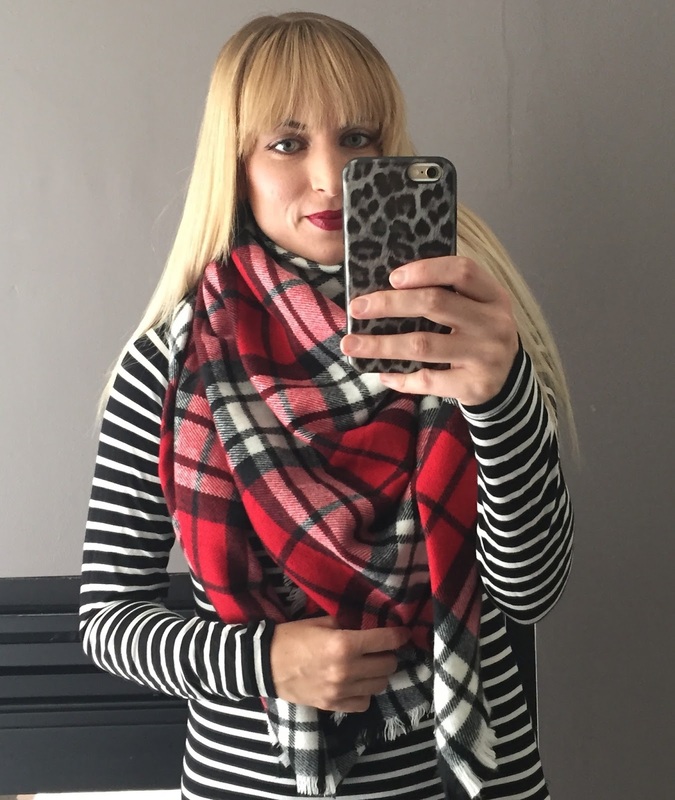 It's one of my favourite (unique) ways to wear a blanket scarf! I love all your looks and agree that stripes and plaid is totally made for each other. Plaid and stripes is one of my favorite combos too! I love your blanket scarf! I'm really loving your blanket scarf. It's gorgeous, and every single one of your outfits are perfect!